Medieval Monday with Judith Sterling & a Giveaway! 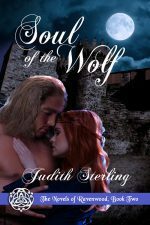 It’s Medieval Monday and I have author Judith Sterling here with our week six excerpt from her novel Soul of the Wolf (The Novels of Ravenwood, Book Two). Don’t forget to leave Judith a comment to be in the running for our First Encounter giveaway opportunity. A winner will be randomly chosen once all weeks in this blog hop are finished. Read on and enjoy! So ’twas she. His stomach twisted. “I see,” he said. But he wished he didn’t. A man could lose his soul staring into the warm, inviting depths of her eyes. A Norman loyalist, Lady Jocelyn bristles when ordered to marry Wulfstan, a Saxon sorcerer. She nurses a painful secret and would rather bathe in a cesspit than be pawed by such a man…until her lifelong dream of motherhood rears its head. A man of magic and mystery, Wulfstan has no time for wedded bliss. He fears that consummating their marriage will bind their souls and wrench his focus from the ancient riddle his dying mother begged him to solve. He’s a lone wolf, salving old wounds with endless work. But Jocelyn stirs him as no woman ever has. Their attraction is undeniable. Their fates are intertwined. Together, they must face their demons and bring light to a troubled land. Find Judith’s snippet next week at the blog of Barbara Bettis here. You can find my snippet this week on Judith’s blog here. Don’t forget to keep following our first encounter theme and to comment. Thanks for stopping by! Wow! This book sounds so intriguing. I’ve added it to my to-read list. Thanks again for hosting me, Sherry! I enjoyed reading the excerpt from “Soul of the Wolf.” The characters and their conflicts sound like they make for an interesting story. Sounds very intriguing. I love Medieval Historicals.